A few years ago, the standard bearing franchise in the Real-Time Strategy (RTS) genre, ‘Age of Empires’ made its first bold adventure outside of the PC redoubt with the launch of an adaptation of ‘Age of Empires: The Age of Kings’ for the DS. It was a risky decision, especially since the creators decided to boot the RTS modality that had characterized the franchise in favor of a turn-based approach. There was some initial outrage and a few seething responses for this change, but in general the game was fairly well received by both critics and gamers alike. 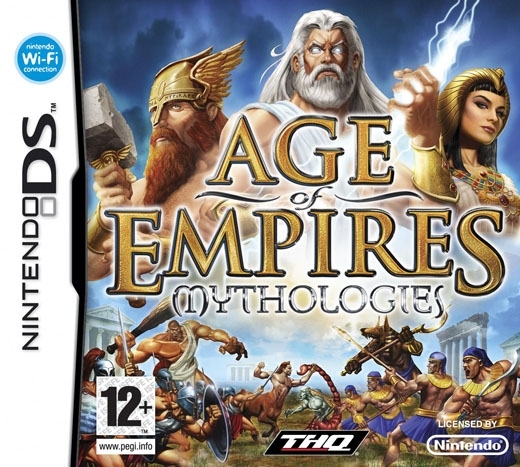 This initial success emboldened the creators to follow up on the project by adapting a second Age of Empires title for Nintendo’s handheld and ‘Age of Mythologies’ was their choice. It was an extremely smart pick, and we’re very happy to say that this is one of those rare instances in which the sequel far outclasses a successful first launch. ‘Age of Empires: Mythologies DS’ addresses and corrects most of the criticism received by ‘Age of Kings DS.' The animation, which was primitive and cartoonish in ‘Age of Kings,' has been radically improved and the battle cinematics we see in the upper screen of ‘Mythologies’ are amongst the most refined ever seen on a DS. The units seem very lifelike and you really get the feel that a real battle is taking place as the opposing units lock themselves in combat on screen. Another worthy aspect is that we can now really sense that the choice of civilization matters again, since each side’s units don’t only look different, but fight different and enjoy different strengths and weaknesses as a culture. The sound department has also improved, and is now more varied than before. The battle clips display a varied array of sounds that range from the battle cries of soldiers, to the clash of swords, to the dying grunts. Some of these displays, such as the gnarling sound of the charging chimeras, are so lifelike they are actually a bit scary. The legendary Age of Empires battle hymn is nowhere to be heard in this title, and in fact the only musical accompaniments in the game can be found in the intro and in a short trumpeting clip that precedes every battle. Indeed, there is no musical background (perhaps a wise move since a repetitive background tune in a game that can go on for hours can become quite annoying), but its absence fits well with the earthy and gritty feel of the game. My one remaining complaint in the sound department is the repetitive nature of the heroes’ battle cries; they can get old quite quickly during a match. The game layout and control scheme on the DS is good, but not spectacular. All the real action takes place in the lower screen, while the upper screens serves to display unit and game stats, maps, oracle (more on this later), and combat clips. All items in the upper screen are activated and controlled from the lower screen. The level of detail of units and terrain in the lower screen is worthy of praise, although this very detail can make it quite difficult to appreciate individual units on crowded battlefields. You can move and transmit orders to your units either via the stylus or the control buttons. I personally prefer using the buttons since there is an extremely annoying quick access menu that tends to pop up and block my screen if I rub the touchpad the wrong way. As we mentioned earlier, the gameplay in ‘Mythologies’ is built on a turn-base scheme that contrasts with the real time strategy (RTS) approach the PC versions of the franchise have. This change implies the game suffers from all the known maladies of the turn base genre (a degree of repetitiveness, paused action, and a chess-like feel to it). But it also implies some important advantages as well. The strategic element for instance, is more important than ever since players no longer can resort to quick mouse clicking as a winning tactic. The constraining of action to short clips allows the game to pack into the DS an unusually high quality animation style that might have been impossible otherwise. Finally, it is now easier for gamers to streamline unit production and improvement, and to better pick their battle opponents in the frontlines, thus moving the focus of the game away from the supply side and placing it square on the combat side where the fun is. ‘Mythologies’ is a title in which you get to see human warriors, mythic beasts, legendary heroes, and meddlesome gods struggle to achieve supremacy for their team’s banner. Despite the apparent disparity between these forces, the game boasts a remarkable degree of balance anchored in the tried and proven ‘rock-paper-scissors’ formula used by every single ‘Age of Empires’ game to date. Each unit possesses two categories, dubbed type and class in the game. There are three types of units: human, mythical, and heroic. There are five classes of units: light infantry, heavy infantry, ranged, cavalry, and siege. The damage suffered by two battling units depends on a large measure on these categories. For instance, cavalry excel at defeating ranged and siege units, but fare poorly against light infantry; while heavy infantry fare well against buildings and light infantry, but suffer against cavalry. On the other hand, human units fare poorly against mythic beasts, which fare poorly against heroes, who fare poorly against human units. Keep these factors in mind when attacking, a good mix (say human cavalry vs archer hero) yields better results than a not so ideal one (human cavalry vs mythic light infantry, for example). However, class and type are not the only deciding factors in a duel. There are also secondary issues such as terrain, civilization, unit level, patron deities, relics, and initiative to account for in each combat. Terrains can boost or diminish your potential (forests and hills add defensive power, while roads and plains lessen it). Unit level is another offsetting factor; a level three light infantry will usually overrun a level one heavy infantry even in spite of the usual game wisdom regarding them. Patron deities and relics can also alter the balance by boosting the combat prowess of specific types of units. Finally, initiative matters; he who launches the attack gets a well deserved bonus against the defender. Seems like way too much information to keep track of for every single move? Don’t worry, the game oracle (a kind of match predictor), is always there to advise you on the potential outcome of a duel before you send your units to the field. It’s a very useful tool, especially for beginners, giving them a much welcome edge to make up for the learning curve. Even experienced players can occasionally reap some benefits from the oracle in battle. The best part is that it isn’t too intrusive so if you don’t need it its easy to ignore. As hinted before, civilizations are now a critical aspect determining how you will play this game. There are three ancient cultures in this title: the wealthy but defensive Egyptians, the aggressive Vikings, and the versatile Greeks. The Egyptians enjoy a strong economy and their deities focus mainly on showering them in wealth and defensive boosts (although a few of these divine gifts can be quite crippling to their rivals, such as the Wrath of Anubis, which is perhaps the most feared god power in the game). The Egyptian military is average in combat, but powered by the economic juggernaut of their civilization and their early access to most unit types it can grow to be an impressive force, making them the ideal civilization for beginners. The Greeks, can boast a well balanced and resilient army, with a wide variety of outstanding unit types that work as easily on the attack as on the defense. The Greek deities tend to make very direct interventions in battle, be it by curing all injured units (Athena) or by striking down the foes with heavenly lightning (Zeus and Hera). The Greek tend to struggle at the beginning of a match because their war machine is a bit pricey and takes some time to get it up and running. However, once it reaches its full potential the Greek civilization, with its two heroes and varied lineup is probably the most fearsome foe in the game. The Vikings have the best array of tools for aggressive players. Their civilization is fully geared for a fast, expansionist and dynamic strategy. Their cheap and self-healing military works very well on the attack, and they can usually field significant offensives earlier than their foes. Vikings tend to fare poorly on defense, but their movable oxcarts allow them to shift their production engines away from advancing enemy fire while the frontline situation improves. They also get a bonus for each battle fought whether they win or lose it. The Viking deities almost invariably focus their blessings on helping in the battlefield. All of the above makes the Viking a civilization for advanced players. A match against a capable Viking commander is bound to be a very short one. The game has three campaigns; one for each civilization. The campaigns tend to start out very simple, but quickly scale up the difficulty level and usually close with a fair degree of difficulty. Half of the first campaign, centered on the Egyptians, plays out as a sort of training tutorial. 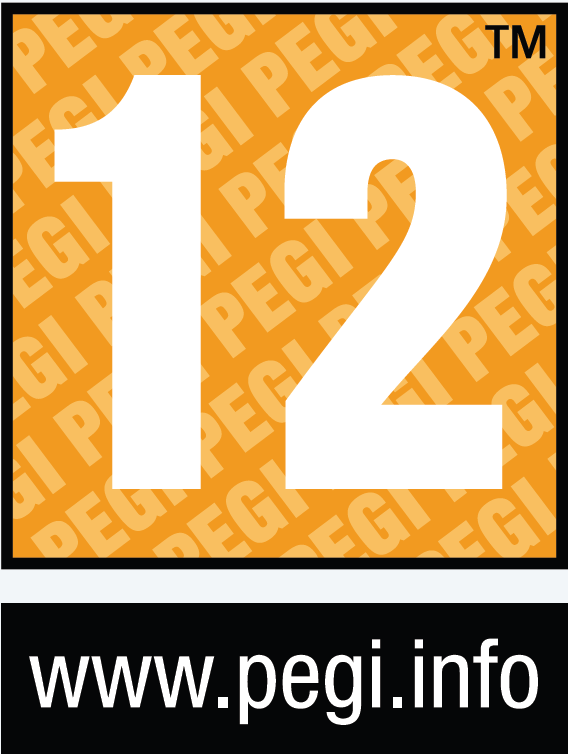 These campaigns can entertain you for some 12 to 15 hours, depending on your degree of skill. Nevertheless, the Age of Empires saga has always placed the lion’s burden of their prestige not on the campaign, but on the multi-player, and ‘Mythologies’ is not the exception. The game allows you three multi-player modes with up to four simultaneous players on screen. The first one, called Hot-Seat allows you to play sharing a single DS by passing it along in turns. Wi-Fi or Wireless allows you to play against another player each using their own DS and cartridge or via the web. The third, DS Download, allows you to enjoy a very restricted match version against a friend who has his own DS but does not own a game cartridge. 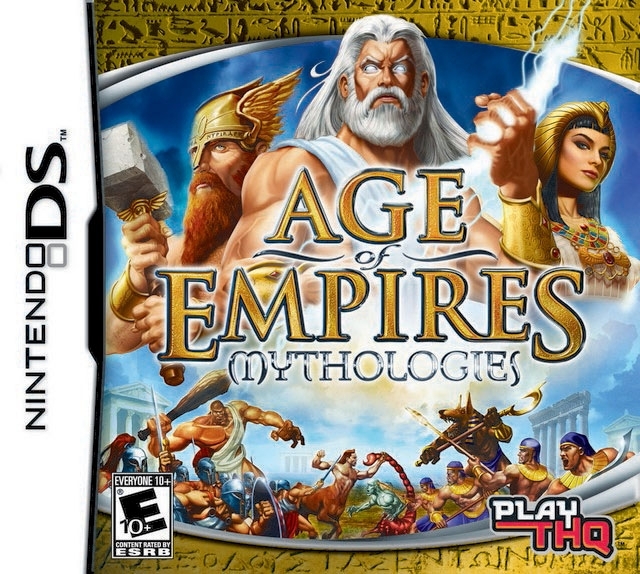 Mythologies’ is one of the best rounded and challenging strategy games to ever hit the DS. The refinement of the animations and the awesome ambient sounds make it a delight to watch. 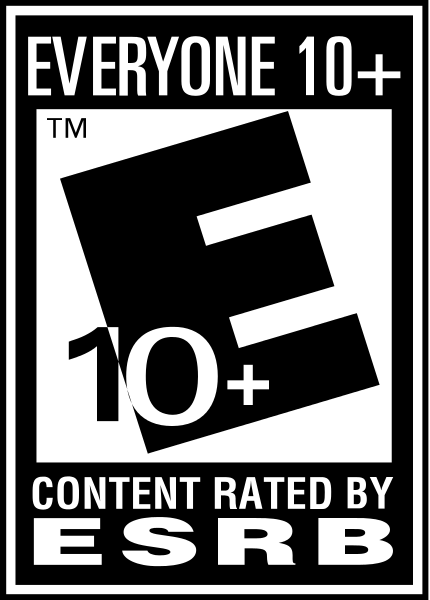 The versatility of the game is enviable, since the almost limitless amount of variables at play guarantees that all matches will be unique experiences, giving the title an enormous replay value. The same wide array of variables also makes it a dream choice for strategy buffs while the oracle feature keeps it accessible enough for beginners and casual players to enjoy. Finally, we can’t close the article without mentioning the enormous gallery of monsters at your disposal. What can be more irresistible than a title in which you can pitch a chimera against a frost giant, a medusa against a laser shooting crocodile, or a band of Viking berserkers against a truck sized beetle? We have to admit it, with all its endless tweaks and surprises this is turning out to be a truly brilliant launch from the creators at Gryptonite Games and the now defunct Ensemble Studios. 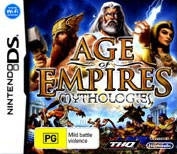 Age of Empires: Mythologies DS is a true contender for the slot of best strategy game on the DS. brilliant game and very addictive!